One of the most intriguing aspects for me in writing a blog is the fact that I really do not know what to write about. To further clarify, the urgent need to write and share something, express it in words, whether it is about a concert, or a person, an event, illumination, reflection etc etc - this is very elusive as well as unpredictable. Many thoughts, ideas come and go. A number of them linger for a while, and a few decide to stay. The same holds to experiences.... a few will stay with me forever. In mid August I gave a solo recital at the Mormon University in Jerusalem. 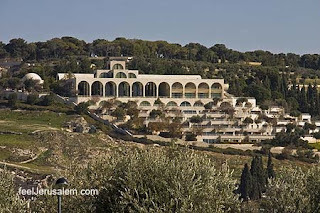 This u niversity was built on the side of Mount Olives overlooking the ancient city of Jerusalem. The auditorium if this very unique place has no backstage area. Instead, there is a gigantic glass wall, and the magnificent landscape of Jerusalem is revealed, almost feels like being excavated. What this glass wall does is somehow bring into the auditorium the scent, the smell, something of the aura of Jerusalem. It is incredibly powerful, so difficult to put into words. The audience is sitting, looking down at the stage with Jerusalem just behind, literally within a hand's reach. My recital began when the sun went down, and the lights of the city "went up." The program included works by Beethoven, Schubert, Brahms and Ginastera. As I walked on the rather big stage, to my right is the sight of a full house, while to my left the city which is holy to so many people - such an inspiring sight yet so intense. This city is a volcano of emotions - good and bad, triumphant and tragic, uplifting and harsh in their reality. All these contradictions unite here in an explosive way. I suddenly had a revelation: Here, now, at this very moment, under these circumstances I could not start with the Beethoven that I had prepared. I needed something else. It needed something else... different... a Bach! And so without a word I sat at the piano and played Bach's "Jesu, joy of man's desiring", the choral from Cantata no. 147 arranged by the legendary pianist Myra Hess - an eternal prayer of hope. There was such silence I would never forget that. It was not in the program, yet it always is. People didn't know, yet they always knew. The much revered musician Richard Goode told me a few months ago that when he played with the Budapest Festival Orchestra the rehearsals always began with playing Bach chorals... to get into a special state of concentration. I would like to give Richard then, and the Budapest orchestra some credit for this idea, which came to me (and stayed...) at the most appropriate moment. After the Bach playing "the rest" of the program not only made sense, it had a sense... of purpose! Beautiful setting, beautiful music, beautiful words. I had the opportunity to first experience your extraordinary ability to not only play the piano, but create an avenue of conveyence to the audience on what you were trying to express. I must say the Stockton Symphony under the direction of Peter Jaffe did an excellent job as well. It was a fine performance I felt for all of you. I'm not normally into classical as such...but your genuine passion for what you do is truly inspiring. You play beautifully. This is the most beautiful performance of "Jesu, joy of man's desiring" I have ever heard. Thank you.